Kiden Nixon’s homelife hasn’t been great since her father was shot right in front of her. Now she parties, picks fights at school, and occasionally freezes time. Kiden’s a mutant, and after her teacher gets shot when Kiden stops time to dodge a bullet meant for her, she runs away. But her dead father’s ghost sends her back to save her teacher and two other mutants. One of them is Laura Kinney, whose pimp objects to her running away and dispatches thugs to hunt down the four women. The quickest way to describe NYX is as a brutal, cruel cousin to Runaways. Quesada’s story is well-written, and his characters have clear voices. The plotting is fairly tight, too; although near the end Kiden’s father’s instructions begin to feel like an easy tool to move the characters into the places he wants them. What I like the most about the book’s plotting is that characters flow in and out of the story as they are relevant; there’s no gratuitous hand-tipping on Quesada’s part, so nothing in this story feels irrelevant. The handoff between art teams is so smooth that, without looking at the credits, I might not have immediately realized that there was a change at all. Middleton’s and Teranishi’s linework is similar in style, and even with multiple inkers and colorists the book looks consistent. Physicality and expressiveness drive the art. My only complaint is that early on, there are occasional panels that feel to me like anime-style fan-service. 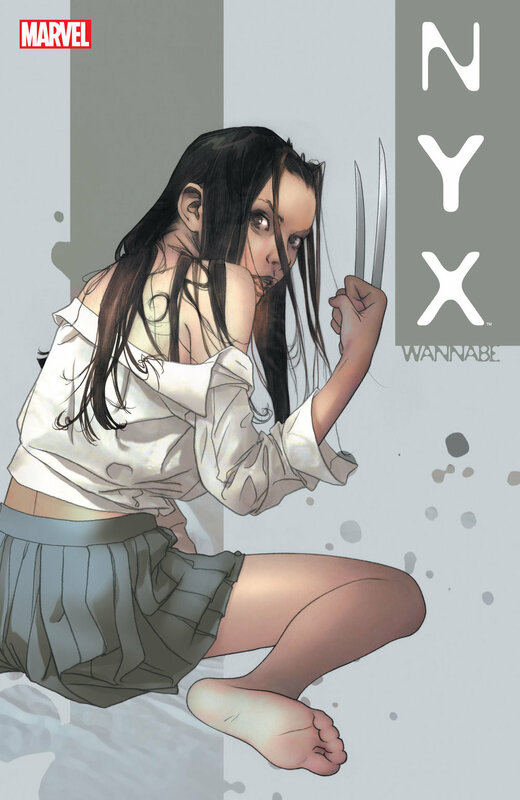 I picked up NYX as part of an effort to track down old Laura Kinney stories after becoming a fan of the character by reading All-New Wolverine. This is, perhaps, not the ideal route to reading NYX. If you come to this title looking for superheroics, you might be disappointed; instead, it’s about people with powers struggling against the brutality of living on the streets and being pursued by reprehensible, misogynistic criminals. That brutality, too, might be a turnoff if you don’t expect it, or if you don’t care for heavy use of gendered slurs—I know that there were certainly moments for me when it felt like too much, even if it was in character. But if that’s not a problem for you and you want a different kind of street-level mutant book, NYX might be up your alley.